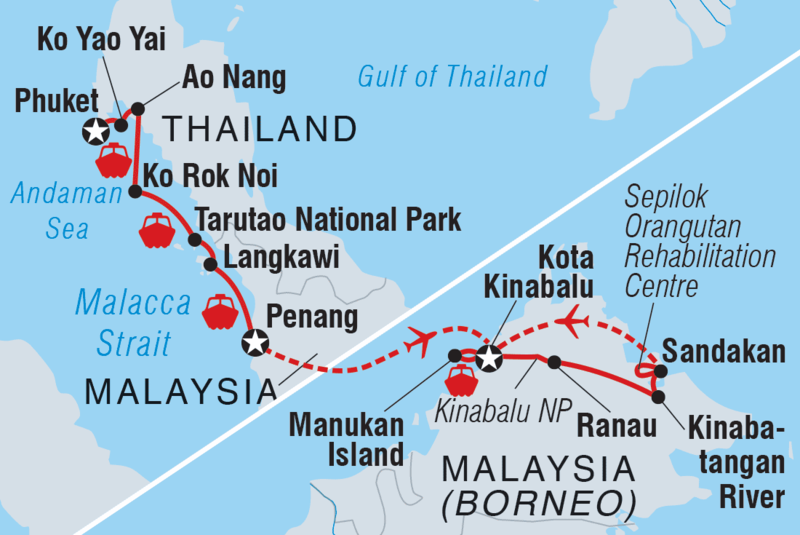 Enjoy the stunning west coast of Malaysia and Thailand on a new small-ship adventure cruise. 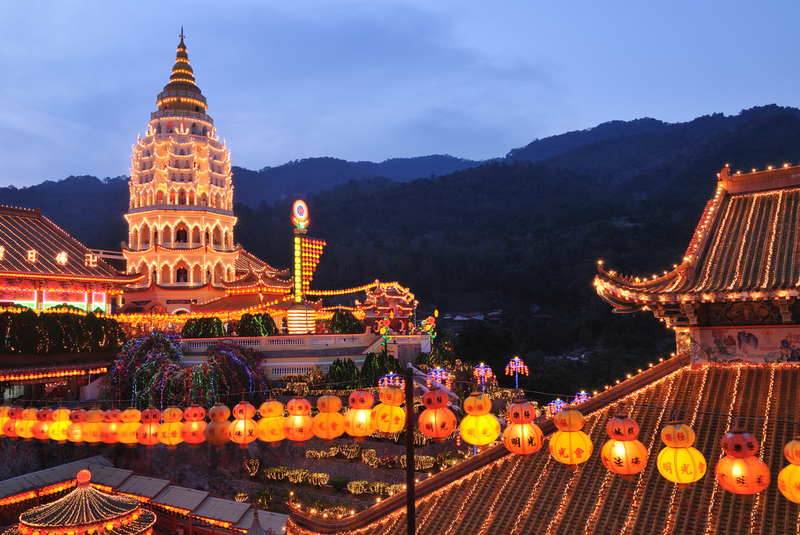 Between the more popular holiday destinations of Phuket and Penang, there’s a medley of smaller islands and villages to explore, each with their own charms – and often far fewer travellers to contend with. 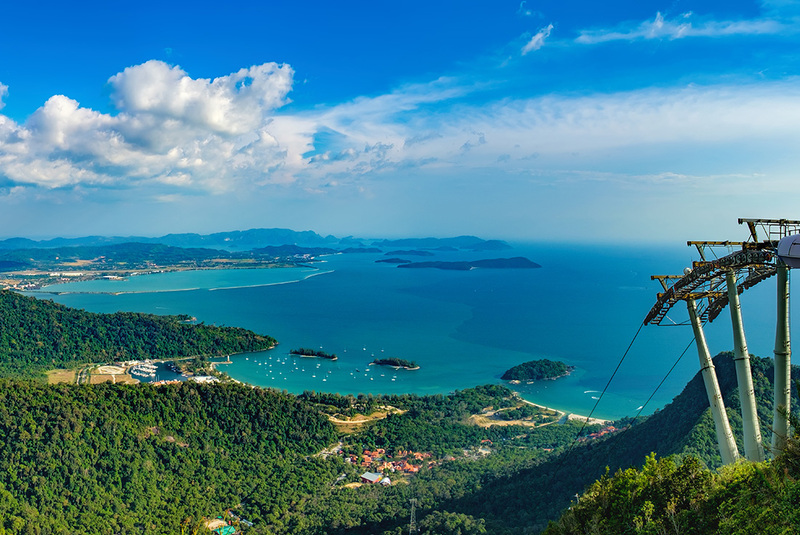 Live it up in postcard-perfect Langkawi, choose from leisure and adventure activities in beachside Ao Nang, join in the relaxed pace of local life in Koi Yao Yai, visit waterfalls hidden in the jungle, and use the Andaman Sea as your swimming pool. With comfortable accommodation onboard, snorkelling and kayaking equipment, and knowledgeable local guides at your service, this is South East Asian paradise done in style. Then travel to Borneo and leave urban life behind. Head into lush jungles, down scenic rivers and through the vibrant villages of beautiful Borneo. On the way, soak up stunning mountain vistas, meet local indigenous people, relax in stunning scenery and have an encounter with some pretty special wildlife. There’s no doubt that this adventure in Borneo will find its way into your heart and leave you with unforgettable memories. Sa-wat dee! Welcome to Thailand. Embarkation takes place between 2 and 4 pm. After meeting your leader and attending a welcome meeting and safety briefing on board, set sail at 5 pm. Enjoy dinner on arrival in Ko Yao Yai, relaxing and taking in the sunset. Climb aboard a songtheaw for a tour with a local guide. Ko Yao Yoi is known for beautiful beaches, friendly Muslim fisherman and diverse birdlife, not to mention some delicious local seafood. We set off in the early afternoon for the short sail to Ao Nang, a lively beachside town in the Krabi province. The night is yours to enjoy – perhaps kick back with a cold drink in one of the local bars. This evening, half of the group will head to Bung Ae House Homestay for an authentic, home-cooked Thai dinner. With a full day in Ao Nang, you're free to partake in a range of optional activities. 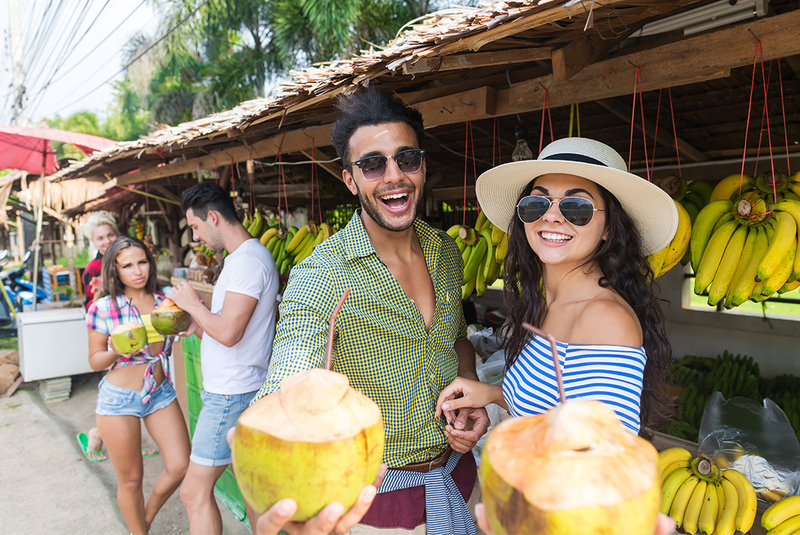 Whip up some local specialties in a Thai cooking class, spot colourful tropical fish on a snorkelling trip, take the adventure to the next level with some diving or rock climbing, unwind with a traditional Thai massage, or make tracks on two wheels to a local waterfall. Another great option is to take a longtail boat to Railay Beach. Alternatively, simply stay on the Panorama II, which can take you around Phang Na bay for some snorkelling and swimming. Tonight, the second group will enjoy the hospitality and delicious Thai food at Bung Ae House. Arrive at around 7 am in beautiful Koh Rok Noi, one of many beautiful islands with white sands and blue-green waters against a jungle backdrop. You'll transfer to the island by Zodiac (a motorised inflatable boat). A full day of beach time is on the agenda, so enjoy some snorkelling, kayaking or paddleboarding. Otherwise, relax on shore and take in the postcard-perfect scene. Late tonight, set sail overnight for Tarutao National Park. Join a local guide for a tour of idyllic Langkawi. This includes a visit to the beautiful Telaga Tujuh Waterfalls – a lovely spot to relax and take in the jungle ambience. In the evening, set sail overnight for Penang. A leisurely sail brings you to Penang at around midday. Enjoy a delicious and fresh local Malaysian lunch at the market, and split up into smaller groups to join local guides for a walking tour around Penang's old town, taking in the historic shophouses, narrow streets and unique atmosphere of the island. Take a rickshaw back to the ship and enjoy a farewell dinner onboard with fellow travellers. Fly from Penang to Kota Kinabalu and transfer to your hotel. Your adventure begins with a Welcome Meeting at 6pm, which you can find details about at the hotel’s reception. If you have any free time beforehand, perhaps explore this intriguing city that was born between the Borneo jungle and the South China Sea. Modern-day 'KK' is a vibrant modern metropolis, having recovered from World War II bombings. The Sabah State Museum is a great place to immerse yourself in its backstory. Leaving Kota Kinabalu behind, you'll head for the hills and travel towards the unspoiled wilderness of the World Heritage-listed Mt Kinabalu National Park (approximately 3 hours). You will stop off en route at a local home at Dusun Village. Sample the local foods with a home cooked lunch to get some insight into what it’s like to live in a rural village. Later you can stretch your legs and soak up the mountain scenery with a stroll through Mt Kinabalu National Park. There are many walking trails from which you can bird watch. The Mountain Botanic Garden is an excellent showcase of the diverse plant life on the mountain, as flora from all over the park has been replanted here. Late in the afternoon you travel by private bus to Sabah Tea Plantation (approximately 30 mins). Tonight you will stay in the grounds of a lush tea garden. After breakfast you will take a tour of the tea factory itself, ending in sampling some of the delicious varieties. From there, head to Kinabatangan River in private mini van, a trip of approximately 5 hours. Your jungle lodge, located beside the river, is ideal for taking in the lush surrounds. At 560 kilometres, the Kinabatangan River is the second longest river in Malaysia. It's also a protected forest reserve, containing some of the highest concentrations of wildlife in Borneo. Later in the afternoon you will take a river cruise, hopefully spotting some of the more exotic local creatures. Wild elephants seldom reveal themselves, but crocodiles, macaques, wild orangutan, proboscis monkeys, hornbills and kingfishers are more easily seen. After this short adventure you'll head back to the lodge to enjoy dinner. You might awake to the call of a Bornean gibbon, or perhaps a hornbill. Enjoy a morning cruise down the river, searching for more birds and wildlife. Keep an eye out for Long Tail Macaques and Pig Tail Macaques – ask your leader about the difference. Later, you can trek up to a birdwatching tower overlooking the river and visit a Merabu tree. When it's all over, this evening's river cruise will be your last chance to photograph or simply marvel at your surrounds. Spend one more night in your lovely accommodation right in the heart of the jungle. Travelling by private minivan, you will stop to visit the intricate Gomantong Caves. Renowned for their edible swiftlet nets, which are harvested for bird's nest soup. Bird's nest collection is an ancient tradition, though nowadays licences are required for it. Travelling to Sandakan, a journey of 3 hours, you will stop in at the Sandakan War Memorial. Here you will learn about the city's past as you stand on the same ground of the former Japanese POW camp. This site also marks the starting point of the tragic Sandakan Death Marches, on which 2,400 POWs were forced to walk through the jungles of Borneo. By the end of the march, only 6 Australians survived, and only because they had escaped. Arrive in Sandakan, which was once the capital of British North Borneo and traditionally has strong trading ties with Hong Kong. The Cantonese influence is palpable in the lively harbour-side market, the many Chinese temples and the local cuisine.